The IEEE Center for Secure Design (CSD) is part of a cybersecurity initiative launched by IEEE Computer Society. The Center provides guidance on a variety of cybersecurity-related topics. Here, we focus on best practices for designing an authentication system. To begin with, when creating an authentication system, there are two common designs from which to choose. The first school of thought is to push all requests through a centralized login system, only allowing endpoints to respond after the authentication system verifies the session and proxies the request. The filter approach is achieved through standard routing and networking. All requests to the application pass through this point before arriving at their destination, and are gated if the requestor isn’t authenticated. Figure 1 shows the high-level design. Figure 1. Pushing all requests through a centralized login system to use authentication as a filter. 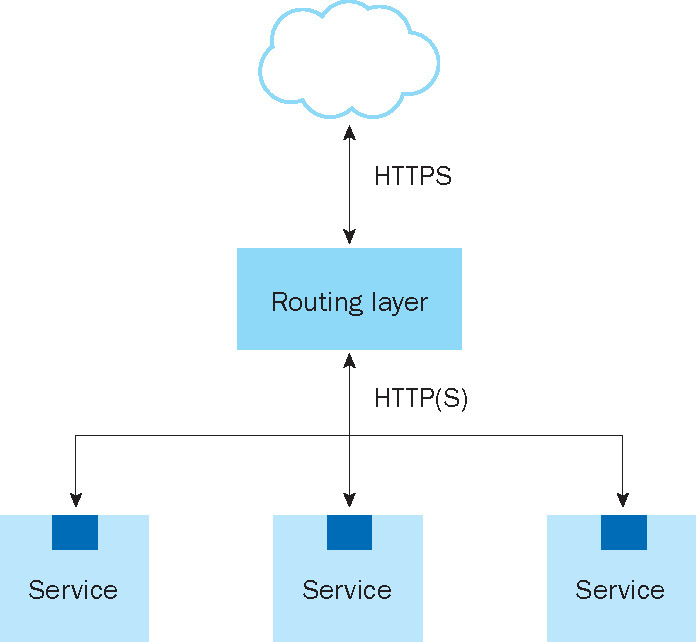 This approach uses standard routing and networking. 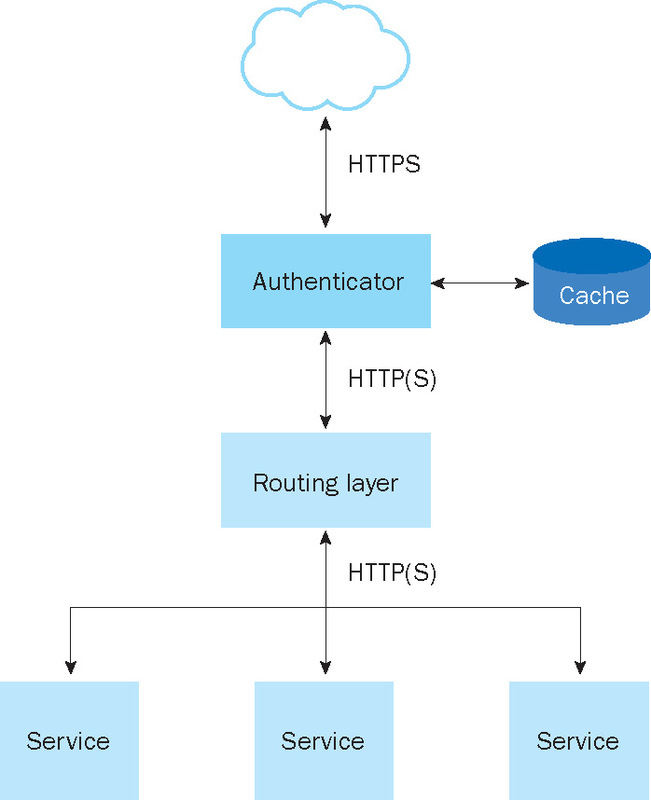 In this scenario, all traffic is filtered through an authentication proxy. This inspects the request for relevant information (a valid cookie, OAuth token, and so on) and verifies it. Upon successful verification, the request is sent to the appropriate service via a routing layer to be completed. If the authentication couldn’t be performed, then the proxy will ask the user to provide valid credentials before continuing. This example assumes that the system is composed of several components. If your system is a single program, where all parts run under the same codebase, you’ll naturally fall into this category. As with any choice, there are benefits and drawbacks to this approach. All traffic is pushed by default to the authentication service. This means that any URLs that are intended to be accessible without authentication would need to be specifically identified within a whitelist. This easily can be reviewed for correctness by automated tests. It reduces the burden on additional services. For instance, if a single request ended up producing five internal requests, we might not want to have five separate authentication events to complete the request. This also reduces the load on the database that contains user credentials, which can create an availability concern if overloaded. Creating a choke point for authentication means that additional engineering will be required to maintain availability at scale. 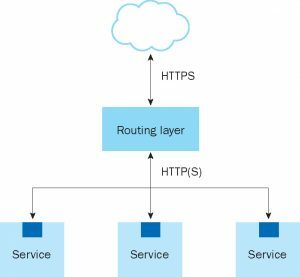 This introduces operational and architectural complexity and requires additional resources (hardware, caching, and so on) to be properly constructed. It leaves internal systems unauthenticated. There are ways to manage this (such as internal HTTP headers or mutually authenticated protocol exchange). This might not be an issue for some designs, but it must be carefully considered when choosing this option. The second pattern (see Figure 2) is to have each endpoint take responsibility for authen- ticating requests. It might be used in conjunc- tion with other authentication architectures to create internal layers of authenticated requests when additional controls are required for accessing data (such as the detokenization of credit card data; see PCI-DSS 3.1 from the PCI Security Standards Council at www.pcisecuritystandards.org/security_standards). Figure 2. Individual endpoint authentication, where each endpoint takes responsibility for authenticating requests. 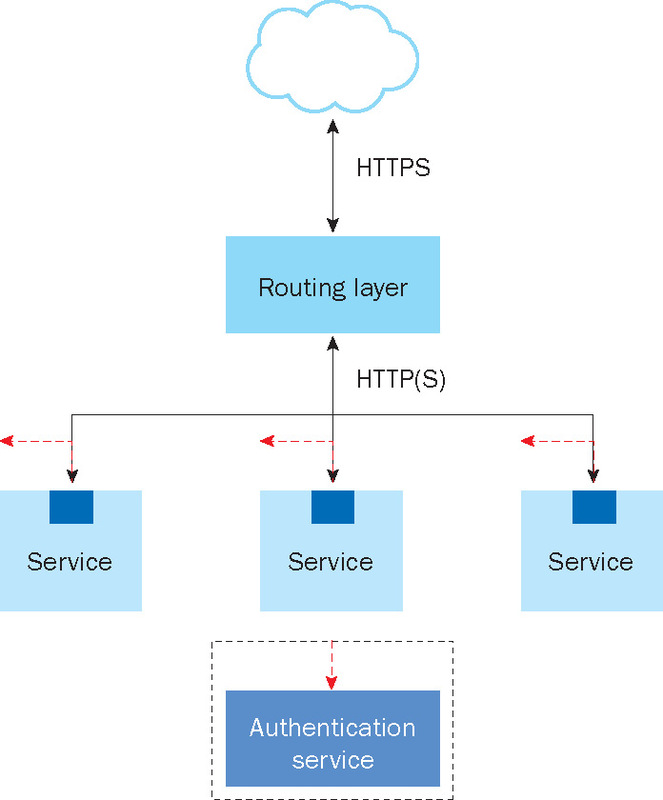 An alternate approach (see Figure 3) uses the same general layout with authentication mechanisms in each service, but makes a service call to an authentication endpoint instead of authenticating inside the service. Figure 3. An alternate approach to individual endpoint authentication. 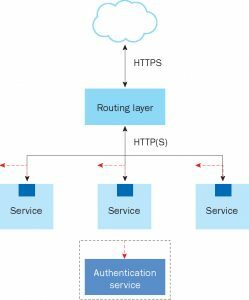 This approach uses the same general layout with authentication mechanisms in each service, but makes a service call to an authentication endpoint instead of authenticating inside the service. Trust is defined at every border, creating a system that allows for different authentication scenarios based on data types. This allows for better definition of trust zones when necessary. If designed incorrectly, this can lead to unnecessarily repeating authentication. In turn, this can create an unnecessary load on critical infrastructure, leading to availability issues. The following are some other useful design options to consider. Exporting resource definitions. A well-designed system should be capable of exporting its assumption of the world. This means that administrators should, with a simple tool or command, be able to ask for a report of the exposed URL patterns and their corresponding access requirements. For filter-based authentication, this means a list of protected and whitelisted endpoints. This report should be available in a programmatically accessible format (such as XML, JSON, or CSV) to allow for automated testing. This allows at a minimum for base system assumptions to be verified on a routine (daily) basis, and also helps seed penetration testing. Explicit authentication bypass (whitelist). The filter architecture will, by default, provide an “always-on” authentication approach. This sets up the system for an explicit whitelist. We generally prefer this approach because it’s less error-prone. Every endpoint that bypasses authentication will have to be manually enabled and, in most development environments, tracked by version control changelogs and production log books. If the filter approach isn’t taken, endpoints that bypass authentication should be explicit and easily managed. The default should be that authentication is always required. Fast IDentity Online (FIDO; https://fidoalliance.org/). Integrate with a third party (if applicable). If possible, don’t run your own authentication system. There are a number of third-party authentication providers available, but choosing the proper provider(s) for a particular situation should be handled on a case-by- case basis. This option works best in publicly available application environments, and isn’t suitable for every application, especially on- premise ones, due to policy or technical reasons. For such cases, especially in more traditional enterprises, applications can be configured instead to delegate authentication tasks to internally maintained instances of centralized authentication providers. What to look for: evaluating an authentication framework. It can be challenging to evaluate a new authentication framework. There are lots of things to look for when making your choice. The aforementioned details describe scenarios and consequences of choices made during the authentication system design. This distillation should serve as a checklist for evaluation. In general, not every item must be satisfied for the framework to be considered for use, but relevant risks and tradeoffs should be considered. Provides the ability to exchange credentials (username/password, token, and so on) for a valid session. Supports proper session management (www.owasp.org/index.php/Session_Management_Cheat_Sheet). Lets users opt in to two-factor authentication. In a browser-based environment, properly marks the session cookie as HTTPOnly (www.owasp.org/index.php/HttpOnly) and secure (www.owasp.org/index.php/SecureFlag). Provides support for Cross-Site Request Forgery (CSRF; goo.gl/TwcSJX) protection/ defenses. Supports token-based authentication mechanisms (such as OAuth). Supports proper password storage (www.owasp.org/index.php/Password_Storage_Cheat_Sheet). Provides integration with third-party authentication providers. Logs all authentication activity (and supports proper audit trails of login/ logout, token creation and exchange, revocation, and so on). Has a public record of good security response, disclosure, and fixes. Supports secure account-recovery flows (third-party authentication providers make this easier). Never exposes credentials in plaintext, whether in user interfaces, URLs, storage, logs, or network communications. Enforces use of credentials with sufficient entropy. Protects against online brute-force attacks. Protects against session fixation attacks. When architects start planning application and individual components, one of the first things they must decide is where access checks occur and how they’re carried out. There are multiple options for performing authorization checks, and opportunities to get it wrong. However, the main rule that must be universally followed–no matter which model the team chooses to implement–is that all authorization decisions and enforcement should take place at the server side. There’s no such thing as a client-side authorization—at best, it can serve as a usability improvement. Authorization can protect actions such as file system access, network socket operations, and other low-level actions tied to the operating system, language, or framework. Authorization can also protect higher-level actions such as funds transfer, purchase history, and other business logic actions. In this section, we focus solely on authorization concerns with the web application users, omitting server-side component and backend authorization concerns. Access controls can be specified on the entity, or subject, performing an action or actions. Subject-based access controls can limit the subject on executing actions, writing data to executed actions, and/or reading data from executed actions. It’s also imperative to always use trustworthy data when making authorization decisions. After all, allowing the request to specify requested privilege and permitted actions, limits, and so on simply defeats the purpose of server- based authorization checks. Creating an access control policy consisting entirely of coarse-grained URLs isn’t practical for those web applications that consist of only a handful of anchor URLs, along with dynamically generated pages or endpoints for other content-based resources. The following example shows an abstraction of a URL-based access control policy. Path elements such as _acc and cf_ comp come from the underlying platform, while viewProfile and drawCharts denote functional endpoints exposed by the application itself. Overall, this construct won’t match the application’s resource hierarchy visible to its administrator. Instead of using HTTP-based terms for resources and actions, good authorization policy engines should allow the use of application-specific terminology to express resource hierarchy and actions (again, using an abstract text-based policy representation for this example). Not all system users are born equal, and the level of their authority should depend upon which part of an application they’re currently trying to access. That is, somebody who’s a privileged user in one application (or line of business) doesn’t have to hold similar privileges in other parts of a system (or relevant applications). For instance, consider an HR user with access to the company’s personnel- and performance-management system consisting of several integrated modules and sharing user accounts. While that HR user holds significant privileges in the application’s personnel-management portion, having a read access to the system’s performance-management portion might suffice for their work duties. In that case, their trust level (and corresponding privileges) should be determined by whether they’re currently dealing with the application’s personnel- or performance-management part. What can be done to allow web applications to differentiate privileges granted to their users? One easy option is to grant user ac- count privileges via statically defined roles, also known as role-based access control (RBAC; see Figure 4). While this approach works for applications with simple access control models, it quickly gets out of hand as the number of roles, tied to various user and group privileges, explodes. An application that needs to make account access decisions based on the user’s office location, role in the company’s hierarchy, relationship to the account, and so on will have an increasingly difficult time capturing all of these nuances with a traditional static RBAC model and, especially, maintaining it over a longer period of time. In large, interconnected systems, it becomes nearly impossible to determine who has access to particular objects or functions, which can result in granting excessive privileges to some users or not revoking privileges in a timely manner when a user’s status changes. Figure 4. Role-based access control (RBAC). This approach grants user account privileges via statically defined roles. Although it’s easy to implement, it’s generally better to use only with applications that have simple access control models. It’s well-supported by all major web application platforms and containers. The approach is easily understood by developers and users alike. Developers might be tempted to hardcode roles into application code. As the complexity of access control logic increases, the number of corresponding roles explodes, resulting in a maintenance nightmare and runtime problems. The static role assignments can become stale and must be forcibly refreshed to pick up the latest changes–this can be a highly time-consuming operation on large systems. Products with highly demanding security models should plan on utilizing dynamic role mapping and authorization based on the user’s profile attributes rather than static security policies—the so-called attribute-based authorization model (see Figure 5). Under this more flexible model, user roles and privileges are dynamically resolved at runtime based on the resource and action combination, and can take into account additional attributes attached to the user’s account. Figure 5. Attribute-based authorization model. This model offers more flexibility, resolving user roles and privileges dynamically at runtime, based on the resource and action combination. Roles are resolved dynamically based on the requested resource and action, allowing for significantly greater flexibility of policy design. Fewer policies are necessary, as user-profile attributes are used to make access decisions at runtime. There’s no built-in support from major web platforms and containers–although this might be available as an add-on option. Implementation is significantly more complicated, beyond the capabilities of regular web application teams–and thus an external solution is advised. Policy design is less intuitive for development teams. To ensure consistent authorization enforcement across a large codebase, we recommend that you centralize your authorization logic (see Figure 6). As an application never exists in isolation, the web application’s team must consider target execution environments. A traditional enterprise application will rely on an array of integrated backend services and applications, which all come with authorization capabilities and requirements. Managing an array of disjoint services could quickly overwhelm an IT department and lead to inconsistent security policies and gaps. To make this process more manageable and consistent, large organizations with complex IT environments often rely on centrally managed security policies, which are then pushed to individual services. RFC 2904 (https://tools.ietf.org/html/rfc2904) uses the term Policy Decision Points (PDP) for the policy management servers. The authorization checks performed at individual services are called Policy Enforcement Points (PEP). It’s the application development team’s responsibility to design their product for such environments and avoid locking in a particular authorization model, which could prove incompatible with models used in target environments. Consumer-oriented applications, on the other hand, have another set of challenges. While their policy models are typically simpler due to fewer types of objects and classes of principals, scalability of their authorization engines plays a critical role. Such applications (think social media portals or popular gaming sites) will potentially handle millions of users. Responsiveness and resource consumption of their policy engines under peak load can create availability issues. This simplifies policies management across heterogeneous environments with many components and systems. It ensures consistency of access control rules across all integrated layers. It might help with audit requirements. The initial setup is significantly more complex and expensive. Some applications could experience performance impact due to remote calls to PDP. For sensitive operations (such as a funds transfer), it’s important to consider adding another layer of user attestation for building higher confidence in the user’s identity and intentions. This is known as adaptive authorization, and is based on collecting and ana- lyzing additional information about a user’s historical behavior patterns. In case of suspicious behavior, the user might be asked to reconfirm their identity by either re-entering the password, or the system might require an additional authentication factor. For example, consider an employee in a retailer’s finance department who handles payments to its suppliers. This employee has always authorized payment transfer requests to domestic suppliers from their home office location in the continental US during daytime hours, but suddenly issues a nighttime funds transfer to an offshore company from a location in Asia. While most traditional authorization policies will allow this request to proceed (assuming the user doesn’t exceed his transfer limits), the adaptive authorization model will likely notice odd behavior and act according to the configured policies. It might require the user to provide additional authentication to proceed, or hold the funds and have the transaction reviewed and confirmed by additional authorized users to prevent fraud by the employee or somebody using his stolen credentials. This helps with catching fraudulent requests not otherwise detectable with traditional access control methods. The system can be trained to learn new access patterns and fringe cases. This might result in false positives, denying access to legitimate requests. A knowledge base of normal and abnormal access patterns constitutes the most important part of the adaptive system; it either must be supplied with the system, or built from scratch during system setup. Initial setup is significantly more complex and expensive. This approach has increased administration overhead. There could be a performance impact due to additional calls and analysis. 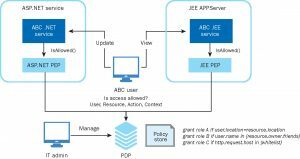 All established web platforms—such as Java Platform, Enterprise Edition (JEE) or ASP.NET—provide interception layers to automatically route all incoming requests through their respective authorization frameworks. This type of interception works for coarse URL-based access control checks, but is often insufficient for making business- logic authorization checks. For instance, in the following sample request, we can base authorization policy on the request type (such as GET, POST, PUT, or DELETE), Referer, Content-Type, Content-Length, and other HTTP-specific attributes. While useful for low-level decision making (for instance, at the Internet-facing front-end HTTP servers), this might be insufficient for some business-level authorization decisions. More complex access control processing might need to take place—for example, in an application or component-specific front gate or a dedicated wrapper, injected at the entry points to business logic services. At that point, the call parameters can be interpreted not simply as generic parameters of HTTP GET or POST methods, but, for instance, as stock symbols, locations, limits, and so on. These business-specific request parameters can then be checked against an authorization policy expressed in business- specific terms. Supports a provider-based model and lets you configure alternative authorization and role-mapping providers. Supports delegating authorization and role-mapping providers to allow evaluating multiple types of policies in the context of a single request. Enables dynamic role evaluation to reevaluate user roles in the context of a specific action or access to some resource. Includes policy-simulation capabilities to answer the following questions: Can user X access resource Y? Who can access re- source Y? Allows policy modeling in native application terminology, as opposed to generic HTTP terms. Provides PEP for all major components of the application under consideration. Meets your scalability and latency requirements. At a conceptual level, each of these potential security issues stems from the same root cause: untrusted data being incorporated into an application and then executed or interpreted in an unplanned way. To comprehensively prevent these types of vulnerabilities, we recommend the use of application- and framework-level approaches that reliably inhibit introducing such bugs during application development. Approach: Use HTML markup/templating systems that only produce encoded output (goo.gl/9ZDStx). XSS vulnerabilities can be avoided by adopting the convention that all HTML markup must be produced by APIs and libraries that guarantee correct, context-specific encoding and validation of data interpolated into HTML markup. In many cases, application developers use HTML templating systems to implement the generation of HTML markup. These templating systems are easy to use and default to encoded output. Often, though, it’s difficult to apply a new templating system across a large application surface. Also, it’s common for exceptions to arise where rich content is intended. With these frameworks, in some cases, applications are still exposed to certain types of XSS–see the Open Web Application Security Project’s (OWASP’s) cheat sheet on preventing XSS for more information (goo.gl/3ImU1k). All languages and platforms have support for manual output encoding. Any time that frameworks can’t be used, output encoding should be used. Input validation isn’t a recommended approach for preventing XSS. It’s often possible to bypass input validation because validation is written with brittle regular expressions that don’t account for encoding. Furthermore, data are frequently shared between systems. For more information, we recommend reading Christopher Kern’s “Securing the Tangled Web” (http://research.google.com/pubs/pub42934.html). Context-aware output encoding is a natural evolution of the standard output encoding mentioned thus far. It means that content is being written with the understanding of where in a rich HTML document it’s going to be used. There are different rules for what’s acceptable within the body, tag attributes, URLs, scripts, and so on. Does the framework perform output encoding by default? Is the documentation clear that overriding the output encoding could allow for a vulnerability? Do static analysis tools identify when the default behavior has been overridden? Does the framework support contextual encoding? Has the framework been reviewed for security? Does the framework have a track record of responding to security issues? Approach: Use an object-relational mapping (ORM) that offers a rich API and parameterizes queries by default (www.owasp.org/index.php/SQL_Injection). SQL injection vulnerabilities can be avoided by using frameworks that perform parameterized queries by default. A parameterized query protects the database engine from running untrusted input as part of the query structure. It’s important that the data access framework supports a rich API to aid developers in building complex queries through the API. This serves to discourage arbitrarily complex but error-prone string concatenation to build queries. It’s possible to augment API functions with helpers that perform additional checking. It’s usually possible to identify anti-patterns when this approach is used, because string concatenation functions represent deviations from the desired pattern. Ensure that the persistence mechanism builds dynamic parameterized queries. Ensure that the API is flexible enough to accommodate complex queries that will be required (so that developers can realistically use the API). Approach: Avoid system commands or use a library to escape the input (www.owasp.org/index.php/Command_Injection). Command injection vulnerabilities often depend on altering a system command through meaningful characters such as a semicolon. As such, command injection vulnerabilities can be avoided by using frameworks that perform user data escapes before issuing the command. As an example, in Ruby, there’s a library called Shellwords (http://ruby-doc.org/stdlib-2.0.0/libdoc/shellwords/rdoc/Shellwords.html) that can translate a potentially malicious string input into an innocuous string. Another consideration is to use popen, which gives programmers explicit control over all aspects of the process launch. Opt for escaping libraries that are available within the language or a core framework. Ensure that the escaping library handles common cases of operating system special characters. Approach: Avoid writing your own serialization libraries, and know which are intended to be able to handle malicious input. It’s quite common for applications to parse serialized data that have been received from an untrusted source. Parsing code that’s implemented in a non-memory-safe language, especially if the format is a binary one, can be prone to memory-corruption bugs. Deserializers that transform a serialized representation (in XML or JSON, for example) into corresponding data objects are often implemented using reflection. Mistakes in the design of reflection-based deserializers can result in vulnerabilities where the deserialization of untrusted input might cause unintended code to execute (for example, during object construction, or via access to nontrivial setter methods). Some serialized representations have complex features that can result in security issues if supported or enabled in the parser. For example, XML supports so-called external entities, which refer to an external resource identified by a URL included in the input XML. If external entity resolution is enabled in the XML parser, a maliciously crafted XML document might instruct the XML processor to source and include any resource identified by a URI. The following are recommendations around serialization and deserialization. Avoid writing ad hoc implementations of parsers, especially in non-memory-safe languages. Instead, use a well-vetted library or parser generator. When using third-party libraries, carefully consider whether they’re suitable for processing untrusted inputs, and review their security record. Don’t use Python’s pickle module (https://docs.python.org/2/library/ pickle.html) to process (that is, “unpickle”) untrustworthy inputs. Don’t use Ruby’s YAML or Marshal to process untrustworthy inputs. When choosing a library that unmarshals serialized forms into objects, consider approaches that don’t rely on runtime reflection, and instead rely on compile-time code generation (such as Protocol Buffers or Thrift). This completely avoids risks related to the use of reflection. Avoid the use of ad hoc string concatenation to produce serialized forms, relying instead on a well-vetted library to do so. When choosing a library, consider its security record, and whether it comprehensively addresses injection issues through appropriate validation and escaping. Use the framework provided for URL processing. Avoid “stringly typed” data: don’t introduce application domain-specific string representations for structured data (such as colon-separated string representations of tuples). Instead, use structured data types. When building cross-platform applications, consider a standard interchange format such as Thrift. Opt for serialization libraries that are available within the language or a core framework. Prefer formats that can be suitably configured to parse entirely untrustworthy serialized forms. Ensure that XML parsers are configured to not resolve external entities. Approach: Favor frameworks that support explicit wiring as opposed to reflection (www.owasp.org/index.php/Unsafe_Reflection). Some web frameworks support a convention-over-configuration paradigm, where (for instance) specific request handlers are automatically wired up with request URL paths through naming conventions related to the names of handler classes and methods. Implementations of such frameworks typically achieve this through the use of reflection or reflection-like mechanisms in the underlying language. Although this is desirable and convenient from a developer’s perspective, this approach to framework design can result in considerable security risks. By design, it exposes control over code execution (such as control over the reflective invocation of particular methods) to external attackers (including, for example, components of an HTTP request, or path components that are used to directly designate a method to be executed). This can result in security problems at two levels: First, there might be bugs in the framework itself that permit an attacker to cause execution of code that isn’t meant to be directly invoked by an external entity, and whose execution has security consequences. Second, it might result in the inadvertent external exposure of application-level functions whose direct invocation has security consequences. Expression languages (EL) can pose a significant risk. If an attacker can cause evaluation of attacker-controlled expression strings, this can result in the attacker’s ability to execute arbitrary code on the server. Adopting frameworks that enforce clear separation of the data and control structures is a general way to address a number of classes of common software security vulnerabilities. Whenever possible, lean toward adopting frameworks that provide these controls. Opt for frameworks that don’t by default expose controller endpoints or routes. Lean toward frameworks that allow explicit wiring. Prefer frameworks whose implementations have been security reviewed. Review the framework’s vulnerability history for issues in this area. Applications often incorporate large amounts of third-party code into libraries. As an example, a simple Spring template application generated from the Spring Initializr includes 57 dependencies. A similar Rails application template generated with Rails Composer includes 96 dependencies. Some industry experts estimate that more than 80 percent of the code included in an average project is actually code from these third-party libraries. Given that any code can have vulnerabilities, it’s important to understand that vulnerabilities can be introduced to an application through these third-party libraries–and a significant portion of the risk involved in building an application can come from these dependencies. We recommend the following approaches to prevent such vulnerabilities. Manually reviewing a code base for vulnerable dependencies is a slow and error-prone task. It’s a great candidate for automation. Automated dependency- checking tools scan application dependencies against a database of existing vulnerabilities. These automated tools often can be added in to build automation and continuous integration systems that provide feedback early and often. To get the most out of automated scanning, it’s useful to set it up as part of a continuous integration system. There should be a mechanism to update the database. Dependency versions should be scoped. Critical—fix as soon as possible while managing availability risk. Important—fix within the next sprint or release window. Background—fix within a quarter with other application updates. The response plan should be agreed upon by stakeholders up front, so that it can be followed when the time comes. Even with automation, manually reviewing dependency vulnerability is still necessary. To help you keep up to date, you can subscribe to specific mailing lists for your dependencies, or use catch-all lists (such as the following examples). the Microsoft Security Bulletin (goo.gl/L6Y703). Because the approaches mentioned aren’t frameworks, there’s no evaluation checklist that supports them. The attack surface of an application includes substantial code from third-party frameworks. It’s critical to identify and address vulnerabilities in these dependencies. Automated tools can help to identify these issues early in development and make it easier to update. A process for triaging them can help to keep them prioritized across stakeholders. This document, along with others, came to fruition through the collaborative efforts of many participants at the CSD’s 2015 workshops. We thank everyone for their contributions, especially John Downey and Matt Konda. 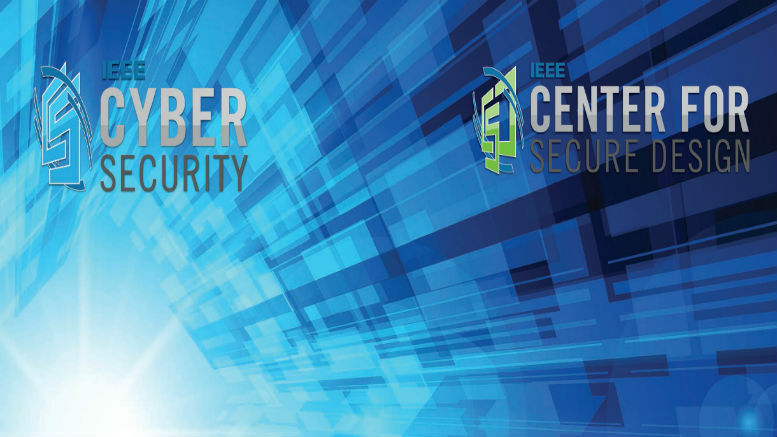 If you’re interested in keeping up with the IEEE Center for Secure Design’s activities, follow us on Twitter @ieeecsd or via our website (http://ieeecybersec.wpengine.com/). If you would like to help with CSD activities, contact us at ieee-csd@ieee.org. Because the authors, contributors, and publisher are eager to engage the broader community in open discussion, analysis, and debate regarding a vital issue of common interest, this document is distributed under a Creative Commons BY-SA license. The full legal language of the BY-SA license is available here: http://creativecommons.org/licenses/by-sa/3.0/legalcode. Attribution–You must give appropriate credit, provide a link to the license, and indicate if changes were made. You may use any reasonable citation format, but the attribution may not suggest that the authors or publisher has a relationship with you or endorses you or your use. “ShareAlike”–If you remix, transform, or build upon the material, you must distribute your contributions under the same BY-SA license as the original. That means you may not add any restrictions beyond those stated in the license, or apply legal terms or technological measures that legally restrict others from doing anything the license permits. Please note that no warranties are given regarding the content of this document. Derogatory use of the content of this license to portray the authors, contributors, or publisher in a negative light may cancel the license under Section 4(a). This license may not give you all of the permissions necessary for a specific intended use.